This quickly composed salad is not the recipe I am sharing, no not at all! Today's recipe is for the salad dressing that you see drizzled over the greens. Often when we enjoy a salad with our meals it is not a traditional salad in a recipe sort of way. For example, what you see over this platter of salad greens is a Caesar dressing, yet there are no croutons scattered over the greens, and it is more than just romaine lettuce. 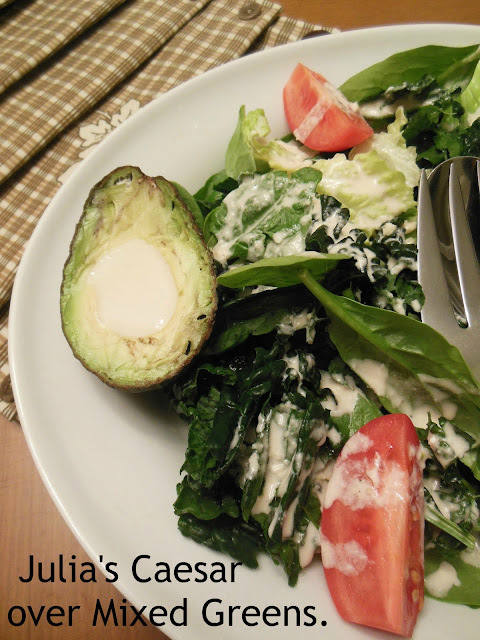 A variety of greens is often on our table in salad form, and I have come to not only enjoy the fresh taste but crave a salad with such flavor and variety. This salad contained Romaine, Tuscan Kale, and Baby Spinach. Combine garlic through mayonnaise, whisk until smooth. Whisk in oil. Taste, add salt if desired. Refrigerate until needed, drizzle over salad greens of choice. for those that want a bit more dressing to enjoy! Very fun way to serve extra salad dressing! I love a good homemade dressing! I am working towards no purchased dressings, this one is a favorite already. Your salad looks so good with all this heavy food I have been eating! Hope you have a great week and thanks so much for sharing with us at Full Plate Thursday! Thanks Miz Helen, and thanks for hosting Full Plate Thursday. I can eat Caesar dressing on just about anything. ;-) Thanks for sharing it with Souper Sundays. Me too, I love a chicken caesar sandwich...thanks for visiting.